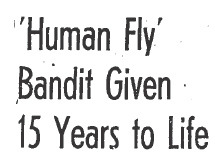 Carl G. Hopper, the human fly, was sentenced in May 1943 to fifteen years to life for his crimes. But surely nobody could have expected the human fly to be content to sit in Folsom Prison while some of the best years of his life, um, flew by. Hopper wangled an early parole so that he could join the Army — but if Folsom couldn’t hold him how could the Army expect to? 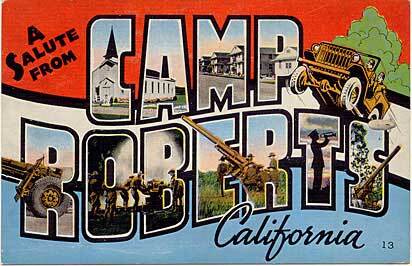 By late October 1944 he’d escaped from the guardhouse at Camp Roberts. On October 27, 1944 at 7:50 p.m.Hopper was observed in a car listed as stolen, he was approached by a radio patrolman and a military policeman at Third Street near Lucas Avenue. He got out of the car and walked toward the officers. He drew a gun and made his escape when the M.P.’s gun jammed as he tried to fire at the fleeing man. An hour later Hopper held up John D. Bowman of Downey in front of 1212 Shatto Street. Bowman told cops that the bandit was “too drunk to know how to drive”, so he forced Bowman to start his (Bowman’s) car for him and then he sped away. Next he turned up in Beverly Hills where he accosted Freddie Schwartz and Maude Beggs as they arrived at 514 N. Hillcrest Street for a party. Schwartz complied with Hopper’s demand for money, but he only had a $5 bill which Hopper hurled back at him in disgust complaining that it was not enough. At 10:35 pm. Hopper held-up Sherman Oaks residents Mr. and Mrs. Julian N. Cole and Mr. and Mrs. Walter Deutsch on Valley Vista Blvd. He took $25 from Cole and $2 from Deutsch. Only minutes later he held-up Dorothy Snyder in the 600 block of S. June Street, but he refused to take her money when he discovered she had only $7 in her purse. The fly was a gentleman. Hopper’s one man crime wave continued. A about half a block away from where he’d encountered Dorothy Snyder he held up Dr. Rudolph Mueller, getting away with $65. Shortly after robbing Dr. Mueller, Hopper was observed driving at a high rate by two officers, S.W. Stevenson and K.M. Aitken, who pursued him until he crashed into a palm tree on Second Avenue near Santa Barbara Street. The fly fled on foot between two houses. About ten minutes following the car crash Hopper committed another hold-up — this time he robbed C.B. Kaufman of his sedan and $55 near 43rd Street and Western Avenue. Then the fly disappeared, at least for a few days. At the Mexican border near Tijuana, Hopper was busted when he was thwarted in an attempt to shoot a U.S. Customs Service inspector who had halted him for routine questioning. The inspector, Richard McCowan, wasn’t entirely satisfied with Hopper’s answers to his questions and ordered him to wait. Hopper responded by pulling out a .38 caliber revolver and jamming it into McCowan’s abdomen. The fly had apparently seen too many western movies because he tried to discharge the weapon by fanning it, like he was Quick Draw McGraw, but failed to pull the hammer back far enough — he was taken into custody. Hardly. When he was busted he had a gasoline ration book and a driver’s license made out to C.B. Kaufman, the man who had been robbed of $55 and his sedan. During the couple of days he was conducting his one man crime wave, Hopper had committed six robberies, netting him $147, and he had stolen three automobiles, one of which was a police car! Carl was returned to the Los Angeles County Jail where he was booked on suspicion of the various crimes committed during his escape from Camp Roberts. His bail was set at $10,000. Hopper was tried, convicted and then sentenced to life in Folsom Prison. Not surprisingly, the fly was considered to be a habitual criminal. 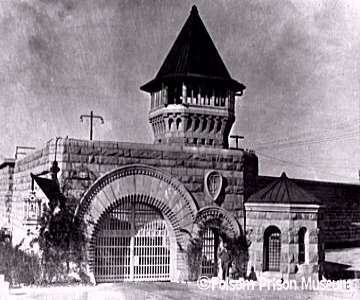 On December 12, 1946, only three years after his escape from the Hall of Justice Jail in Los Angeles, Carl Hopper attempted to break out of Folsom. He slugged a guard, ran to the top cell block, broke a skylight and made his way to temporary freedom over the roof, and down the ladder of an unmanned guard tower. Then he took a 12 foot leap from a wall. Unfortunately for Hopper he got no further than the prison yard when he discovered the American River, swollen by recent rains, was far too dangerous to cross. When guards found Hopper he said that he was “cold, wet and hungry”. He was returned to his cell. 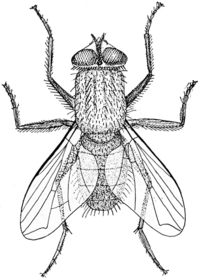 The ordinary housefly lives from 15 to 30 days. The human fly never reached old age. 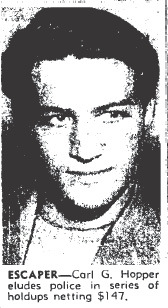 On June 23, 1949, six years after his daring escape from the Hall of Justice Jail in Los Angeles, twenty-nine year old Carl Hopper, the human fly, hanged himself with a bed sheet tied to a piece of plumbing in his solitary cell in Folsom Prison. This entry was posted in 1940s, Hanging, L.A. Times, LAPD, LASD, Suicide, Theft and tagged Carl Hopper, Folsom Prison, Hall of Justice Jail, human fly by Deranged. Bookmark the permalink. I’m shocked the army took him! What were they thinking? The Fly knew he could never live his life out behind bars, so he left the best way he knew how. Joan, this would make a great movie, but only if you wrote the script. I was lmao! to follow the straight and narrow! I can see it now, a movie on the fly’s exploits 😉 what a hoot! LoWith the right casts and you writing the script, it would be a very interesting movie. Think Tony Curtis in “The Great Imposter.” Along those lines. Oh, yes — Tony Curtis would have been marvelous as the human fly! Fabulous idea, Sherry. i had to snort and giggle at Hall of Justice Jail! wtf, was he in Marvel comics or something? Did clark Kent report on him for the daily planet? now a days, he would have been in a rehab program of some type…I think life was too harsh a sentence. I mean now a days, when murder gets you declared not guilty, and a book and a movie deal…armed robbery is like petty crap. If the Army was smart, they would have coaxed him into an interesting spy ring, like being a scout…or spy…flipping and climbing…he could have been a neat o James Bond…and that is something he probably would have loved to do… such a shame.